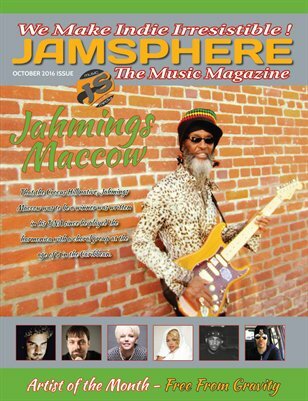 The October 2016 issue of our monthly Indie Music Magazine - FEATURED THIS MONTH - Jahmings Maccow , Free From Gravity, Omar Bowing, Stoner Train, Maverick Hill, Stig Gustu Larsen, Base Level Inc., Eye'z, Candice Russell, Sleep Keepers, The Khancept, Changing Trains, Boy Eats Girl, Des Brennan, Matt Hatter, Blue Soul Ten, Brad Rau, Zach Wolf, G.H. Hat, AfterPxrty, Correigh, Etop - Jamsphere covers all news, reviews, interviews and events of the world's top independent music artists from all genres. Every month we choose the cream of the crop for our magazine, ready for digital download or to be delivered as a physical printed copy right to your door. Copies are also distributed to industry professionals and music's top tastemakers, as we continue our quest to make indie irresistible!